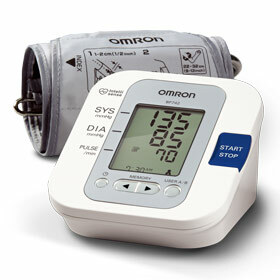 An Omron blood pressure monitor is a wise investment if you want to take control of your health. Omron monitors are highly respected and receive consistently high ratings for user satisfaction and accuracy and on this page I will give you the details on a number of these monitors but first I wanted you to know what kind of company you will be buying from because I think this is important, especially in these days of rampant corporate greed and financial crises brought about by vested interests on Wall Street. Mr Tateisi’s philosophy was "Try it first. Don't just say 'I can't. Try and find a way to do it." He believed that the words "I can't" were essentially the same as "I give up," and that it is only through determination and persistence that people grow. In 1956, he took part in a study group organized by Japan's Keizai Doyukai (Association of Corporate Executives) that looked at management's responsibility to society, through which he came to the conclusion that companies should not only pursue profit, but also act as responsible corporate citizens by giving back to the society in which they operate which led in 1959 to the company’s motto "At work for a better life, a better world for all." In the late 1960’s he developed an artificial arm for thalidomide victims and the first one went to a young girl who was able to grasp a piece of chalk and write on a blackboard. In 1972, OMRON Taiyo Co., Ltd. In partnership with Japan Sun Industries set up Japan's first factory run and staffed by workers with physical disabilities. It began operations in Beppu, Oita Prefecture. Since then, the company has consistently generated profits and steadily expanded operations, setting up a second factory in 1986. They have great environmental policies and environmental awareness training for their employees as well as a great sense of responsibility to their employees, customers and business partners and to the wider community. They donate around $7 million dollars each year to social welfare, disaster aid, science and technology, arts and culture, international co-operation and the environment. They really are a great company. Compared to a company like APPLE which also makes good products but has been slow to embrace any sense of corporate responsibility, Omron get my vote in the good guy stakes. 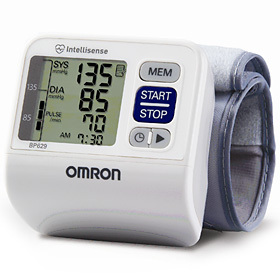 So if you buy an Omron blood pressure monitor you not only get a great piece of technology to support your own health but you are supporting initiatives to improve the world. 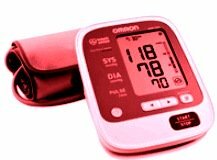 If you haven’t done so already you might want to look at my home blood pressure monitors page to see the advantages of owning one. 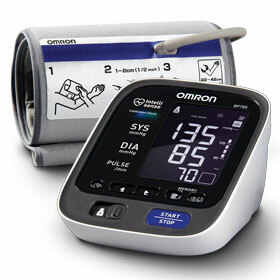 The most important feature of an Omron blood pressure monitor is consistently accurate results. 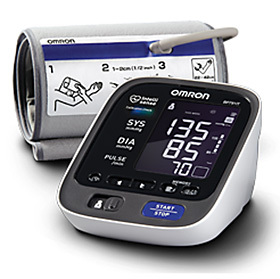 Every Omron blood pressure monitor has been factory tested to meet safety and accuracy standards set by independent medical instrumentation organisations globally. Omron offers a range of monitors including upper arm and wrist units, designed to offer both accuracy and convenience. 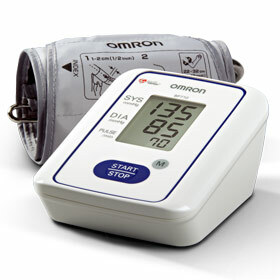 Omron blood pressure monitors are all easy to use and are provided with local support and service. One-touch operation with automatic inflation. Simple and Portable Design - Discreet and convenient portable wrist unit allows users to monitor their blood pressure at home, work or anywhere. 60 Memory Storage with Date and Time - 60 memory storage with date and time stamp allows you to review the last 60 readings with a touch of a button. 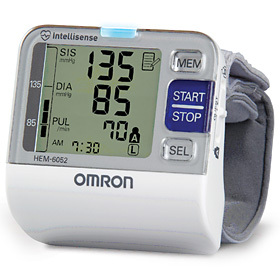 Omron BP652: 7 Series™ Wrist Blood Pressure Monitor. automatically activates when your wrist is at heart level to ensure an accurate reading (Flashing orange and blue indicator lights help guide your wrist to your heart level, making it easier to find the correct position). two user mode to allow you to store readings for you and one other person. slim design is more discrete and convenient for portability, allowing users to monitor their blood pressure at home, work or anywhere. Irregular Heartbeat Detector can detect and alert you to irregular heartbeats while your blood pressure is being measured. Advanced Averaging automatically displays the average of up to the last 3 readings taken within the last 10 minutes. 200 Memory Storage - 100 memory storage for each person (200 total) with date and time stamp allows you to review the last 100 readings with the touch of a button. Irregular Heartbeat Detector – This monitor can detect irregular heartbeats while your blood pressure is being measured. If an irregular heartbeat is detected, an indicator icon will appear alerting you so you can consult with your medical professional. Memory Storage with Date and Time - 14 memory storage with date and time stamp allows you to review the last 14 readings with a touch of a button. ComFit™ Cuff - Patented by Omron, the pre-formed arm cuff expands to fit both regular and large sized arms (9" to 17") to ensure more comfortable, accurate readings. Cuff Wrap Guide - Indicator confirms the cuff has been wrapped correctly on your arm. Irregular Heartbeat Detector - This monitor can detect and alert you to irregular heartbeats while your blood pressure is being measured. BP Level Indicator - Shows how your reading compares to international recognized guidelines for normal home blood pressure levels. AC Adapter - This monitor includes an AC adapter that plugs into your wall and ensures your monitor is ready to use whenever you are. 60 Memory Storage - 60 memory storage with date and time stamp allows you to review the last 60 readings with the touch of a button. Calibration Check System - Dual sensors automatically double check each reading, providing you with added reassurance that each reading is accurate. Two User Mode - Allows two different users to monitor and track their readings separately in the stored memory. TruRead™ - Automatically takes three consecutive readings one minute apart and displays the average, following the guidelines set by internationally recognized organizations for home blood pressure measurement. AM/PM Averaging - With a touch of a button you can review an eight week history of your weekly morning and evening blood pressure averages. 200 Memory Storage - 100 memory storage for each person (200 total) with a date and time stamp allows you to review the last 100 readings with a touch of a button. 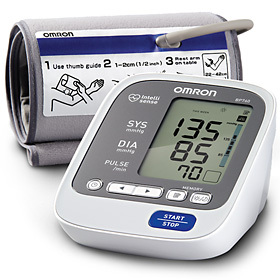 The 10 Series™+ Omron blood pressure monitor has all the features of the top-line 10 Series, plus there's built-in software that connects to your home computer so you can download a digital record of your blood pressure. That way, it's easier for you to track your progress and email your readings to your doctor. Calibration CheckSystem – Dual sensors automatically double check each reading, providing you with added reassurance that each reading is accurate. Cuff-Wrap Guide – Indicator confirms the cuff has been wrapped correctly on your arm. ComFit™ Cuff – Patented by Omron, the pre-formed arm cuff expands to fit both regular- and large-sized arms, to ensure more comfortable, accurate readings. Two-User Mode – Allows two different users to monitor and track their readings separately in the stored memory. TruRead™ – Automatically takes three consecutive readings one minute apart and displays the average, following the guidelines set by internationally recognized guidelines for home blood-pressure measurement. AM/PM Averaging – With a touch of a button, you may review an eight-week history of your weekly morning and evening blood-pressure averages. Irregular Heartbeat Detector – This monitor can detect irregular heartbeats while your blood pressure is being measured. If an irregular heartbeat is detected, an indicator icon will appear, alerting you so you may consult with your medical professional. BP-Level Indicator – Shows how your reading compares to internationally recognized guidelines for normal home blood-pressure levels. AC Adapter – This monitor includes an AC adapter that plugs into your wall and ensures your monitor is ready to use whenever you are. 200-Memory Storage – 100-memory storage for each person (200 total) with date and time stamp allows you to review the last 100 readings with a touch of a button. Dimensions: 9¾" x 7⅛" x 5"